For the technical architecture, not chip implementations, see IA-64. Itanium (/aɪˈteɪniəm/ eye-TAY-nee-əm) is a type Intel microprocessors with 64-bit chip architecture. Itanium processors are sometimes used today for servers. Itanium processors have been produced by HP and several other manufacturers. As of 2008[update], Itanium was the fourth-most deployed chip for business systems. When first released in 2001, Itanium's speed was disappointing compared to other processor types. Using existing x86 applications and operating systems was especially bad, with one test in 2001 showing that it was as fast as a 100 MHz Pentium (1.1 GHz Pentiums were on the market at that time). Itanium did not have success compared to IA-32 or RISC, and was even worse when x86-64 was released, which worked with older x86 applications. In an article from 2009 about the history of Itanium — "How the Itanium Killed the Computer Industry" — journalist John C. Dvorak reported "This continues to be one of the great fiascos [bad situations] of the last 50 years" . Technology writer Ashlee Vance wrote that slowness in speed and release "turned the product into a joke in the chip industry." In an interview, Donald Knuth said "The Itanium approach...was supposed to be so terrific—until it turned out that the wished-for compilers were basically impossible to write." Both Red Hat and Microsoft said that they would stop allowing Itanium to be used with their operating systems. However, other Linux distributions such as Gentoo and Debian are still available for Itanium. On 22 March 2011, Oracle said they would no longer support Itanium, but support for their existing products would continue. In October of 2013, Oracle said they would release Oracle Database 12.1.0.1.0 on HP-UX Itanium 11.31 by early 2014. A past Intel company official said that Itanium had become profitable (Able to make a lot of money) for Intel in late 2009. In 2009 and later, Itanium was mostly used on servers by HP, which made 95% of Itanium servers, so the primary operating system for Itanium was HP-UX. On 22 March 2011, Intel said they will keep supporting Itanium entirely with many new Itanium chips being created and on-time. Although Itanium did do well with high-end computing, Intel wanted it to have more usage compared to the original x86 architecture. AMD decided on an easier idea, creating x86-64, a 64-bit addition to the x86 architecture, which Microsoft soon supported in Microsoft Windows, so Intel had to include the same type of 64-bit addition in Intel's x86 processors. x86-64 can use existing 32-bit applications at full hardware speed, but has 64-bit memory addressing and other additions to new applications. This architecture has now become the most used 64-bit architecture in the desktop and laptop market, with the 64-bit ARMv8 architecture powering many mobile devices, used in today's iPhones, iPads, iPod Touches, and now many Android phones and tablets such as the Nexus 6P and Nexus 9. Ssome Itanium-based workstations were initially introduced by companies such as SGI, but they are no longer available. Because AMD made the first x86-64 chip, the architecture is commonly referred to as "amd64" inside of operating systems. 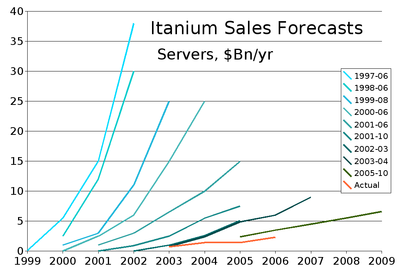 Itanium Server Sales forecast history. In 1989, HP thought Reduced Instruction Set Computing (RISC) architectures were stuck at one instruction per cycle. HP researchers tried to create a new type of processor architecture, later called Explicitly Parallel Instruction Computing (EPIC), that allows the processor to use many instructions in each clock cycle. EPIC uses a form of very long instruction word (VLIW) architecture, in which 1 instruction word had many instructions. With EPIC, the compiler checks which instructions can be used at the same time, so the processor can run the instructions without needing complicated methods to see which instructions to use at the same time. The goal of this idea is to allow better inspection of the code at the time of compile to check for additional opportunities for multiple executions at once, and to simplify processor design and save electricity by removing the need for runtime scheduling instructions. HP thought that it was not good for individual enterprise system companies like HP to make proprietary processors, so HP worked with Intel in 1994 to create the IA-64 architecture, made with EPIC's ideas. Intel wanted to make a large effort in creating IA-64 in the expectation that the resulting processor would be used by most enterprise systems. HP and Intel had a large design effort to make the first Itanium product, Merced, in 1998. During creation, Intel, HP, and other industry analysts thought that IA-64 would be very popular in servers, workstations, and desktops, and one day replace RISC and Complex Instruction Set Computing (CISC) architectures for multi-purpose applications. Compaq and Silicon Graphics stopped working on their Alpha and MIPS architectures to move to the Itanium architecture. Intel announced the name of the processor, Itanium, on 4 October 1999. In only a few hours, the name Itanic had been used as a joke, (a reference to Titanic, the "unsinkable" ship that sank in 1912 ("Itanium + Titanic = Itanic")). "Itanic" has also been used by The Register, and others, to say the multi-billion-dollar investment in Itanium, and the early demand with it, would mean nothing because they thought Itanium was going to fail. By the time Itanium was released in June 2001, its performance was not superior to competing RISC and CISC processors. Itanium competed with low-power systems (primarily 4-CPU and small systems) with servers based on x86 processors, and with high-power such as with IBM's POWER architecture and Sun Microsystems' SPARC architecture. Intel shifted Itanium to working with the high-power business and HPC computing, trying to copy x86's successful market (i.e., 1 architecture, many system vendors). The success of the 1st processor version was only with replacing PA-RISC in HP systems, Alpha in Compaq systems and MIPS in SGI systems, but IBM also made a supercomputer based on this architecture. POWER and SPARC were strong, and the x86 architecture grew more into the enterprise space, because of easier scaling and very large install base. Only a few thousand systems using the 1st Itanium processor, Merced, were sold, because of poorer performance, high cost and less Itanium-made software. Intel saw that Itanium required more native software to work well, so Intel made thousands of systems for independent software vendors to help them make Itanium software. HP and Intel brought the 2nd Itanium processor, Itanium 2, to market a year later. The Itanium 2 processor was released in 2002, for enterprise servers and not all of high-power computing. The 1st version of Itanium 2, code-named McKinley, was created by HP and Intel. It fixed many of the problems of the 1st Itanium processor, which were mostly caused by a bad memory subsystem. McKinley had 221 million transistors (25 million of them were for logic), and was 19.5 mm by 21.6 mm (421 mm2) and was created with a 180 nm design process, and a CMOS process with 6 layers of aluminium. In 2003, AMD released the Opteron, which implemented the first x86-64 architecture (called AMD64 at the time). Opteron was much more successful because it was an easy upgrade from x86. Intel implemented x86-64 in its Xeon processors in 2004. Intel released a new Itanium 2 processor, code-named Madison, in 2003. Madison used a 130 nm process and was the foundation of all new Itanium processors until June 2006. In March 2005, Intel announced that it was working on a new Itanium processor, code-named Tukwila, to be released in 2007. Tukwila would have 4 processor cores and would replace the Itanium bus with a new Common System Interface, which would also be used by a new Xeon processor. Later in that year, Intel changed Tukwila's release date to late 2008. In November 2005, the largest Itanium server makers worked with Intel and many software vendors to create the Itanium Solutions Alliance, to promote the architecture and speed up software porting. The Alliance says that its members would invest $10 billion in Itanium solutions by the end of the decade. In 2006, Intel delivered Montecito (marketed as the Itanium 2 9000 series), a 2-core processor that had approximately 2x performance and 20% less energy usage. Intel released the Itanium 2 9100 series, codenamed Montvale, in November 2007. In May 2009, the release for Tukwila, Montvale's successor, was changed again, with release to OEMs planned for the first quarter of 2010. The Itanium 9300 series processor, code-named Tukwila, was released on 8 February 2010, with greater performance and memory amount. Tukwila uses a 65 nm process, has between two and four cores, up to 24 MB CPU cache, Hyper-Threading technology and new memory controllers. It also has double-device data correction, which helps to fix memory issues. Tukwila also has Intel QuickPath Interconnect (QPI) to replace the Itanium bus architecture. It has a maximum inner-processor bandwidth of 96 GB/s and a maximum memory bandwidth of 34 GB/s. With QuickPath, the processor has built-in memory controllers, which controls the memory using QPI interfaces to communicate with other processors and I/O hubs. QuickPath is also used with Intel processors using the Nehalem architecture, so that Tukwila and Nehalem might be able to use the same chipsets. Tukwila incorporates four memory controllers, each of which supports multiple DDR3 DIMMs via a separate memory controller, similar to the Nehalem Xeon processor code-named Beckton. The Itanium 9500 series processor, code-named Poulson, is the follow-on processor to Tukwila and was released on 8 November 2012. Intel says it skips the 45 nm process technology and uses the 32 nm process technology instead; it features 8 cores, has a 12-wide issue architecture, multi-threading additions, and new instructions for parallelism, including virtualization. The Poulson L3 cache size is 32 MB. L2 cache size is 6 MB, 512 I KB, 256 D KB per core. Poulson's size is 544 mm², less than Tukwila's size (698.75 mm²). At ISSCC 2011, Intel presented a paper called, "A 32nm 3.1 Billion Transistor 12-Wide-Issue Itanium Processor for Mission Critical Servers." Given Intel's history of sharing details about Itanium microprocessors at ISSCC, this paper most likely refers to Poulson. Analyst David Kanter speculates that Poulson will use a new architecture, with a more advanced form of multi-threading that uses as many as two threads, to improve performance for single threaded and multi-threaded work. New information was released at Hot Chips conference. The new information claims improvements in multithreading, reliability improvements (Instruction Replay RAS) and some new instructions (thread priority, integer instruction, cache pre-fetching, data access hints). In Intel's Product Change Notification (PCN) 111456-01, it listed 4 models of Itanium 9500 series CPU, which were removed in a revised version of the document. The parts were later listed in Intel's Material Declaration Data Sheets (MDDS) database. Intel later posted Itanium 9500 reference manual. In comparison with its Xeon server processors, Itanium has never been a large product for Intel. Intel does not release production numbers. One industry analyst estimated that the production rate was 200,000 processors per year in 2007. According to Gartner Inc., the total number of Itanium servers (not processors) sold by all vendors in 2007, was about 55,000. (It is unclear whether clustered servers counted as a single server or not.) This compares with 417,000 RISC servers (spread across all RISC vendors) and 8.4 million x86 servers. IDC reports that a total of 184,000 Itanium-based systems were sold from 2001 through 2007. For the combined POWER/SPARC/Itanium systems market, IDC reports that POWER captured 42% of revenue and SPARC captured 32%, while Itanium-based system revenue reached 26% in the second quarter of 2008. According to an IDC analyst, in 2007, HP had about 80% of Itanium system revenue. According to Gartner, in 2008, HP had 95% of Itanium sales. HP's Itanium system sales were at $4.4 Billion at the end of 2008, and $3.5 Billion by the end of 2009, compared to a 35% decline in UNIX system revenue for Sun and an 11% drop for IBM, with an x86-64 server revenue increase of 14% during this period. In December 2012, IDC released a research report stating that Itanium server shipments would remain flat through 2016, with annual shipment of 26,000 systems (a decline of over 50% compared to shipments in 2008). As of 2015[update], only a few providers have Itanium systems, such as HP, Bull, NEC, Inspur and Huawei. Intel offers a chassis that can be used by system integrators to build Itanium systems. HP, the only one of the industry's top 4 server manufacturers to sell Itanium systems today, creating at least 80% of all Itanium systems. HP sold 7,200 systems in the first quarter of 2006. Most Itanium systems sold are enterprise servers and machines for large-scale technical computing, with each system costing about US$200,000. A typical system uses eight or more Itanium processors. The Itanium bus communicates with the rest of the system. Enterprise server makers differentiate their systems by making their own chipsets that interface the processor to memory, interconnections, and peripheral controllers. The chipset is the heart of the system-level architecture for each system design. Creation of a chipset costs tens of millions of dollars and represents a major commitment to the use of the Itanium. IBM created a chipset in 2003, and Intel in 2002, but neither of them has developed chipsets to support technologies such as DDR2 or PCI Express. Currently, modern chipsets for Itanium supporting such technologies are manufactured by HP, Fujitsu, SGI, NEC, and Hitachi. The "Tukwila" Itanium processor model had been designed to share a common chipset with the Intel Xeon processor EX (Intel’s Xeon processor designed for four processor and larger servers). The goal is to streamline system development and reduce costs for server OEMs, many of whom develop both Itanium- and Xeon-based servers. However, in 2013, this goal was pushed back to "evaluated for future implementation opportunities". HP-UX 11i, an Intel 64 (x86-64) port was proposed, but later canceled. OpenVMS I64, an Intel 64 (x86-64) port is being developed. NonStop OS, an Intel 64 (x86-64) port was developed. Microsoft announced that Windows Server 2008 R2 would be the last version of Windows Server to support the Itanium, and that it would also discontinue development of the Itanium versions of Visual Studio and SQL Server. Likewise, Red Hat Enterprise Linux 5 (first released in March 2007) was the final Itanium version of Red Hat Enterprise Linux and Canonical's Ubuntu 10.04 LTS (released in April 2010) was the last supported Ubuntu release on Itanium. HP will not be supporting or certifying Linux on Itanium 9300 (Tukwila) servers. In late September 2012, NEC announced a return from IA64 to the previous NOAH line of proprietary mainframe processors, now produced in a quad-core variant on 40 nm, called NOAH-6. Oracle Corporation announced in March 2011, that it would drop development of application software for Itanium platforms, with the explanation that "Intel management made it clear that their strategic focus is on their x86 microprocessor and that Itanium was nearing the end of its life." However, a California state judge ruled that Oracle will have to continue supporting and releasing new versions of its software designed for Intel Itanium-based servers sold by Hewlett-Packard, after a settlement and release agreement between HP, Oracle and Mark Hurd had revealed that Oracle must continue to offer its product suite on HP's Itanium-based server platforms and does not confer on Oracle the discretion to decide whether to do so or not. Oracle's obligation to continue to offer its products on HP's Itanium-based server platforms lasts until such time as HP discontinues the sales of its Itanium-based servers. Oracle was ordered to port its products to HP's Itanium-based servers without charge to HP. HP sells a virtualization technology for Itanium called Integrity Virtual Machines. To allow more software to run on the Itanium, Intel supported the development of compilers optimized for the platform, especially its own suite of compilers. Starting in November 2010, with the introduction of new product suites, the Intel Itanium Compilers were no longer bundled with the Intel x86 compilers in a single product. Intel offers Itanium tools and Intel x86 tools, including compilers, independently in different product bundles. GCC, Open64 and Microsoft Visual Studio 2005 (and later) are also able to produce machine code for Itanium. According to the Itanium Solutions Alliance over 13,000 applications were available for Itanium-based systems in early 2008, though Sun has contested Itanium application counts in the past. The ISA also supported Gelato, an Itanium HPC user group and developer community that ported and supported open source software for Itanium. Emulation is a technique that allows a computer to execute binary code that was compiled for a different type of computer. Before IBM's acquisition of QuickTransit in 2009, application binary software for IRIX/MIPS and Solaris/SPARC could run via type of emulation called "dynamic binary translation" on Linux/Itanium. Similarly, HP implemented a method to execute PA-RISC/HP-UX on the Itanium/HP-UX via emulation, to simplify migration of its PA-RISC customers to the radically different Itanium instruction set. Itanium processors can also run the mainframe environment GCOS from Groupe Bull and several x86 operating systems via instruction set simulators. Itanium is aimed at the enterprise server and high-performance computing (HPC) markets. Other enterprise- and HPC-focused processor lines include Oracle Corporation's SPARC M7, Fujitsu's SPARC64 X+ and IBM's POWER8. Measured by quantity sold, Itanium's most serious competition comes from x86-64 processors including Intel's own Xeon line and AMD's Opteron line. Since 2009, most servers were being shipped with x86-64 processors. In 2005, Itanium systems accounted for about 14% of HPC systems revenue, but the percentage has declined as the industry shifts to x86-64 clusters for this application. An October 2008 paper by Gartner, on the Tukwila processor stated that "...the future roadmap for Itanium looks as strong as that of any RISC peer like Power or SPARC." Area chart showing the representation of different families of microprocessors in the TOP500 ranking list of supercomputer, from 1993 to 2013. An Itanium-based computer first appeared on the list of the TOP500 supercomputers in November 2001. The best position ever achieved by an Itanium 2 based system in the list was #2, achieved in June 2004, when Thunder (LLNL) entered the list with an Rmax of 19.94 Teraflops. In November 2004, Columbia entered the list at #2 with 51.8 Teraflops, and there was at least one Itanium-based computer in the top 10 from then until June 2007. The peak number of Itanium-based machines on the list occurred in the November 2004 list, at 84 systems (16.8%); by June 2012, this had dropped to one system (0.2%), and no Itanium system remained on the list in November 2012. The Itanium processors show a progression in capability. Merced was a proof of concept. McKinley dramatically improved the memory hierarchy and allowed Itanium to become reasonably competitive. Madison, with the shift to a 130 nm process, allowed for enough cache space to overcome the major performance bottlenecks. Montecito, with a 90 nm process, allowed for a dual-core implementation and a major improvement in performance per watt. Montvale added three new features: core-level lockstep, demand-based switching and front-side bus frequency of up to 667 MHz. During the HP vs. Oracle support lawsuit, court documents unsealed by Santa Clara County Court judge revealed in 2008, Hewlett-Packard had paid Intel Corp. around $440 million to keep producing and updating Itanium microprocessors from 2009 to 2014. In 2010, the two companies signed another $250 million deal, which obliged Intel to continue making Itanium central processing units for HP's machines until 2017. Under the terms of the agreements, HP has to pay for chips it gets from Intel, while Intel launches Tukwila, Poulson, Kittson and Kittson+ chips in a bid to gradually boost performance of the platform. Kittson is planned to follow Poulson in 2015. Kittson, like Poulson, will be manufactured using Intel's 32 nm process. Few other details are known beyond the existence of the codename and the binary and socket compatibility with Poulson and Tukwila, though moving to a common socket with x86 Xeon "will be evaluated for future implementation opportunities" after Kittson. June: HP and Intel announce partnership. September: HP, Novell, and SCO announce plans for a "high volume UNIX operating system" to deliver "64-bit networked computing on the HP/Intel architecture". October: Compaq announces it will use IA-64. June: IDC predicts IA-64 systems sales will reach $38bn/yr by 2001. October: Dell announces it will use IA-64. December: Intel and Sun announce joint effort to port Solaris to IA-64. March: SCO admits HP/SCO Unix alliance is now dead. June: IDC predicts IA-64 systems sales will reach $30bn/yr by 2001. June: Intel announces Merced will be delayed, from second half of 1999 to first half of 2000. September: IBM announces it will build Merced-based machines. October: Project Monterey is formed to create a common UNIX for IA-64. February: Project Trillian is formed to port Linux to IA-64. August: IDC predicts IA-64 systems sales will reach $25bn/yr by 2002. October: Intel announces the Itanium name. October: the term Itanic is first used in The Register. February: Project Trillian delivers source code. June: IDC predicts Itanium systems sales will reach $25bn/yr by 2003. July: Sun and Intel drop Solaris-on-Itanium plans. August: AMD releases specification for x86-64, a set of 64-bit extensions to Intel's own x86 architecture intended to compete with IA-64. It will eventually market this under the name "AMD64". June: IDC predicts Itanium systems sales will reach $15bn/yr by 2004. October: IDC predicts Itanium systems sales will reach $12bn/yr by the end of 2004. November: IBM's 320-processor Titan NOW Cluster at National Center for Supercomputing Applications is listed on the TOP500 list at position #34. November: Compaq delays Itanium Product release due to problems with processor. March: IDC predicts Itanium systems sales will reach $5bn/yr by end 2004. June: Itanium 2 is released. April: IDC predicts Itanium systems sales will reach $9bn/yr by end 2007. April: AMD releases Opteron, the first processor with x86-64 extensions. June: Intel releases the "Madison" Itanium 2. February: Intel announces it has been working on its own x86-64 implementation (which it will eventually market under the name "Intel 64"). June: Intel releases its first processor with x86-64 extensions, a Xeon processor codenamed "Nocona". June: Thunder, a system at LLNL with 4096 Itanium 2 processors, is listed on the TOP500 list at position #2. November: Columbia, an SGI Altix 3700 with 10160 Itanium 2 processors at NASA Ames Research Center, is listed on the TOP500 list at position #2. December: Itanium system sales for 2004 reach $1.4bn. February: IBM server design drops Itanium support. June: An Itanium 2 sets a record SPECfp2000 result of 2,801 in a Hitachi, Ltd. Computing blade. September: Itanium Solutions Alliance is formed. September: Dell exits the Itanium business. October: Itanium server sales reach $619M/quarter in the third quarter. October: Intel announces one-year delays for Montecito, Montvale, and Tukwila. January: Itanium Solutions Alliance announces a $10bn collective investment in Itanium by 2010. February: IDC predicts Itanium systems sales will reach $6.6bn/yr by 2009. June: Intel releases the dual-core "Montecito" Itanium 2 9000 series. April: CentOS (RHEL-clone) places Itanium support on hold for the 5.0 release. October: Intel releases the "Montvale" Itanium 2 9100 series. November: Intel renames the family from Itanium 2 back to Itanium. December: Red Hat announces that it is dropping support for Itanium in the next release of its enterprise OS, Red Hat Enterprise Linux 6. February: Intel announces the "Tukwila" Itanium 9300 series. April: Microsoft announces phase-out of support for Itanium. October: Intel announces new releases of Intel C++ Compiler and Intel Fortran Compiler for x86/x64, while Itanium support is only available in older versions. March: Oracle Corporation announces that it will stop developing application software, middleware, and Oracle Linux for the Itanium. March: Intel and HP reiterate their support of Itanium. April: Huawei and Inspur announce that they will develop Itanium servers. February: Court papers were released from a case between HP and Oracle Corporation that gave insight to the fact that HP was paying Intel $690 million to keep Itanium on life support. SAP discontinues support for Business Objects on Itanium. September: In response to a court ruling, Oracle reinstitutes support for Oracle software on Itanium hardware. January: Intel cancels Kittson as a 22 nm shrink of Poulson, moving it instead to its 32 nm process. November: HP announces that its NonStop servers will start using Intel 64 (x86-64) chips. December: HP announces that their next generation of Superdome X and Nonstop X servers would be equipped with Intel Xeon processors, and not Itanium. While HP continues to sell and offer support for the Itanium-based Integrity portfolio, the introduction of a model based entirely on Xeon chips marks the end of an era. ↑ 1.0 1.1 De Gelas, Johan (2005-11-09). "Itanium–Is there light at the end of the tunnel?". AnandTech. Retrieved 2007-03-23. ↑ 2.0 2.1 Takahashi, Dean (2009-05-08). "Exit interview: Retiring Intel chairman Craig Barrett on the industry's unfinished business". VentureBeat. Retrieved 2009-05-17. ↑ "Benchmarks – Itanic 32bit emulation is 'unusable'. No kidding — slower than a P100". 2001-01-23. ↑ Dvorak, John C. (2009-01-26). "How the Itanium Killed the Computer Industry". PC Mag. Retrieved 2012-04-15. ↑ 5.0 5.1 5.2 5.3 Vance, Ashlee (2009-02-09). "Ten Years After First Delay, Intel's Itanium Is Still Late". New York Times. Retrieved 2010-04-01. ↑ Knuth, Donald E. (2008-04-25). "Interview with Donald Knuth". InformIT. Retrieved 2010-04-01. ↑ 7.0 7.1 Reger, Dan (April 2010). "Windows Server 2008 R2 to Phase Out Itanium". Retrieved 2010-04-03. ↑ 8.0 8.1 Timothy Prickett Morgan (2009-12-18). "Red Hat pulls plug on Itanium with RHEL 6". The Register. Retrieved 2009-12-18. ↑ 9.0 9.1 9.2 "Oracle stops developing software for Intel's Itanium Chips". Pcworld.com. 2011-03-22. Retrieved 2011-04-12. ↑ Demerjian, Charlie (2009-05-21). "A Decade Later, Intel's Itanium Chip Makes a Profit". The Inquirer. Retrieved 2010-04-07. ↑ Darling, Patrick. "Intel Reaffirms Commitment to Itanium". Itanium. Intel. Retrieved 2011-03-23. ↑ Manek Dubash (July 20, 2006). "Will Intel abandon the Itanium?". Techworld. Retrieved 2010-12-19. Once touted by Intel as a replacement for the x86 product line, expectations for Itanium have been throttled well back. ↑ Charlie Demerjian (2003-09-26). "Why Intel's Prescott will use AMD64 extensions". The Inquirer. Retrieved 2009-10-07. ↑ 15.0 15.1 15.2 15.3 15.4 15.5 15.6 15.7 15.8 "Mining Itanium". CNet News. 2005-12-07. Archived from the original on 2013-01-02. Retrieved 2007-03-19. ↑ 16.0 16.1 Shankland, Stephen (2006-02-14). "Analyst firm offers rosy view of Itanium". CNet News. Archived from the original on 2012-12-06. Retrieved 2007-03-20. ↑ 17.0 17.1 17.2 "Inventing Itanium: How HP Labs Helped Create the Next-Generation Chip Architecture". HP Labs. June 2001. Retrieved 2007-03-23. ↑ 18.0 18.1 18.2 "Itanium: A cautionary tale". Tech News on ZDNet. 2005-12-07. Archived from the original on 2008-02-09. Retrieved 2007-11-01. ↑ 19.0 19.1 Vijayan, Jaikumar (1999-07-16). "ComputerWorld: Solaris for IA-64 coming this fall". Linuxtoday. Retrieved 2008-10-16. ↑ 21.0 21.1 "Sun Introduces Solaris Developer Kit for Intel to Speed Development of Applications On Solaris; Award-winning Sun Tools Help ISVs Easily Develop for Solaris on Intel Today". Business Wire. 1998-03-10. Retrieved 2008-10-16. ↑ "Next-generation chip passes key milestone". CNET News.com. 1999-09-17. Retrieved 2007-11-01. ↑ Shankland, Stephen (1999-07-08). "Intel's Merced chip may slip further". CNET News. Retrieved 2008-10-16. ↑ Kanellos, Michael (1999-10-04). "Intel names Merced chip Itanium". CNET News.com. Archived from the original on 2013-01-02. Retrieved 2007-04-30. ↑ Finstad, Kraig (1999-10-04). "Re:Itanium". USENET group comp.sys.mac.advocacy. Retrieved 2007-03-24. ↑ 26.0 26.1 Pete Sherriff (1999-10-28). "AMD vs Intel – our readers write". The Register. Retrieved 2010-04-06. ↑ Berlind, David (2001-11-30). "Interpreting McNealy's lexicon". ZDNet Tech Update. Retrieved 2007-03-19. ↑ Morgenson, Gretchen (2003-10-19). "Fawning Analysts Betray Investors". New York Times. Retrieved 2010-10-19. ↑ Linley Gwennap (2001-06-04). "Itanium era dawns". EE Times. Retrieved 2009-02-17. ↑ 31.0 31.1 31.2 "Titan Cluster Itanium 800 MHz". TOP500 web site. Retrieved 2007-05-16. ↑ Michael Kanellos (2001-12-11). "Itanium sales off to a slow start". CNET News.com. Retrieved 2008-07-20. ↑ Naffzinger, Samuel D. et al. (2002). "The implementation of the Itanium 2 microprocessor". IEEE Journal of Solid-State Circuits, vol. 37, no. 11, pp. 1448–1460. ↑ Merritt, Rick (2005-03-02). "Intel preps HyperTransport competitor for Xeon, Itanium CPUs". EE Times. Retrieved 2008-10-16. ↑ 35.0 35.1 Shankland, Stephen (2005-10-24). "Intel pushes back Itanium chips, revamps Xeon". ZDNet News. Archived from the original on 2008-02-09. Retrieved 2007-03-17. ↑ "Itanium Solutions Alliance". ISA web site. Retrieved 2007-05-16. ↑ Scott, Bilepo (2006-01-26). "Computing Leaders Announce Strategy for New Era of Mission Critical Computing". Itanium Solutions Alliance Press Release. Retrieved 2008-10-16. ↑ Niccolai, James (2008-05-20). "'Tukwila' Itanium servers due early next year, Intel says". ComputerWorld. Retrieved 2008-10-16. ↑ Gonsalves, Antone (2007-11-01). "Intel Unveils Seven Itanium Processors". InformationWeek. Retrieved 2007-11-06. ↑ Demerjian, Charlie (2009-05-21). "Tukwila delayed until 2010". The Inquirer. Retrieved 2009-05-21. ↑ 42.0 42.1 Tan, Aaron (2007-06-15). "Intel updates Itanium line with 'Kittson'". ZDNet Asia. Retrieved 2007-06-15. ↑ Stokes, Jon (2009-02-05). "Intel delays quad Itanium to boost platform memory capacity". ars technica. Retrieved 2009-02-05. ↑ Ng, Jansen (February 10, 2009). "Intel Aims for Efficiency With New Server Roadmap". DailyTech. Retrieved 2009-02-10. ↑ "Poulson: The Future of Itanium Servers". realworldtech.com. 2011-05-18. Retrieved 2011-05-24. ↑ "Hot Chips Poulson Disclosure Factsheet" (PDF). Intel press release. 2011-08-19. Retrieved 2011-08-19. ↑ 48.0 48.1 "A 32nm 3.1 billion transistor 12-wide-issue Itanium® processor for mission-critical servers" (PDF). 2011-02-24. Retrieved 2012-01-23. ↑ "Researchers carve CPU into plastic foil". Eetimes.com. Retrieved 2010-12-19. ↑ "www.engadget.com". www.engadget.com. Retrieved 2012-04-30. ↑ "ISSCC 2011" (PDF). Retrieved 2011-11-20. ↑ Kanter, David (2010-11-17). "Preparing for Tukwila: The Next Generation of Intel's Itanium Processor Family". Real World Tech. Retrieved 2010-11-17. ↑ "Itanium Poulson Update — Greater Parallelism, New Instruction Replay & More: Catch the details from Hotchips!". 2011-08-19. Retrieved 2012-01-23. ↑ "Intel Itanium Hotchips 2011 Overview". Retrieved 2012-01-23. ↑ 55.0 55.1 "Unreleased Intel Itanium 9500-series CPUs spotted". www.cpu-world.com. ↑ "Spotted 9500-series CPUs confirmed to be "Poulson" Itaniums". www.cpu-world.com. ↑ "Intel publishes Itanium 9500 reference manual". www.cpu-world.com. ↑ Patrizio, Andy (2007-10-12). "Intel Plows Forward With Itanium". InternetNews.com. Retrieved 2007-10-18. ↑ Niccolai, James (2008-05-20). "'Tukwila' Itanium servers due early next year, Intel says". Computerworld. Retrieved 2008-05-21. ↑ 61.0 61.1 Morgan, Timothy Prickett (2010-02-24). "Gartner report card gives high marks to x64, blades". TheRegister.com. Retrieved 2010-02-25. ↑ "Intel shifts gears on Itanium, raising questions about the server chip's future". PCWorld. February 16, 2013. ↑ "Intel Server System SR9000MK4U Technical Product Specification". Intel web site. January 2007. Retrieved 2007-04-14. ↑ Vance, Ashlee (2006-06-01). "HP grabs 90% of 'industry standard' Itanic market". The Register. Retrieved 2007-01-28. ↑ 65.0 65.1 Shankland, Stephen (2005-02-28). "Itanium dealt another blow". ZDNet.co.uk. Retrieved 2007-03-24. ↑ tweet_btn(), Timothy Prickett Morgan 8 Feb 2013 at 23:53. "Remember that Xeon E7-Itanium convergence? FUHGEDDABOUDIT". www.theregister.co.uk. ↑ "Project:IA-64 - Gentoo Wiki". wiki.gentoo.org. ↑ "Red Hat Enterprise Linux technology capabilities and limits - Red Hat Customer Portal". access.redhat.com. ↑ Shankland, Stephen (2000-03-16). "TurboLinux unveils system for Intel's Itanium chip". CNet News. Retrieved 2014-06-08. ↑ "[ia64] End of life..." www.freebsd.org. Retrieved 2014-07-07. ↑ "FreeBSD r268351: Remove ia64". www.freebsd.org. Retrieved 2014-07-07. ↑ "NetBSD/ia64". NetBSD Foundation. Retrieved 2015-08-20. ↑ "HP started then spiked HP-UX on x86 project". The Register. Retrieved June 4, 2015. ↑ Thibodeau, Patrick. "HP gives OpenVMS new life". ComputerWorld. Retrieved December 21, 2014. ↑ "Canonical discontinues Itanium and SPARC support in Ubuntu". The H. 2010-08-20. Retrieved 2010-08-23. ↑ Hewlett-Packard. "Linux on HP Integrity servers based on the Intel Itanium Processor 9100 series". Retrieved 2010-08-23. ↑ "ACOS-4オペレーティングシステム: ソフトウェア - NEC". jpn.nec.com. ↑ Anton Shilov. "Court Orders Oracle to Continue Release and Support Software for Intel Itanium-Based Servers". Retrieved 2012-08-01. ↑ Barker, Matt (2000-11-08). "Intel Announces New Compiler Versions for the Itanium and Pentium 4". Gamasutra (CMP Media Game Group). Archived from the original on 2005-08-19. Retrieved 2007-06-05. ↑ "Intel Compilers". Intel web site. Retrieved 2007-05-16. ↑ "Gelato GCC Wiki". Gelato Federation web site. Retrieved 2007-05-16. ↑ "Documentation at GNU.org". GNU Project web site. Retrieved 2007-05-16. ↑ "Visual C++ Editions". Microsoft. Retrieved 2008-01-05. ↑ Gonsalves, Aantone (2008-05-19). "Computers with Next-Gen Itanium Expected Early Next Year". InformationWeek. Retrieved 2008-10-17. ↑ "Sun Microsystems-Reality Check" (PDF). Sun Microsystems white paper. 2007-01-12. Retrieved 2008-10-16. ↑ "Gelato Developing for Linux on Itanium". Gelato Federation web site. Retrieved 2007-05-16. ↑ Novakovic, Nebojsa (2008-09-25). "Supercomputing now dominated by X86 architecture". The Inquirer. Retrieved 2008-09-27. ↑ Butler, Andrew (2008-10-03). "Preparing for Tukwila: The Next Generation of Intel's Itanium Processor Family". Retrieved 2008-10-21. ↑ "Processor Generation / Itanium 2 Montecito". TOP500 web site. Retrieved 2012-06-19. ↑ "New Intel Itanium Processor 9500 Delivers Breakthrough Capabilities for Mission-Critical Computing". Intel. Retrieved November 9, 2012. ↑ Shilov, Anton. "Intel Launches Eight-Core Itanium 9500 "Poulson" Mission-Critical Server Processor". X-bit Labs. Retrieved November 9, 2012. ↑ Kanter, David. "Poulson: The Future of Itanium Servers". Real World Tech. Retrieved November 9, 2012. ↑ Undy, Steve. "WHITE PAPER Intel Itanium Processor 9500 Series" (PDF). Intel. Retrieved November 9, 2012. ↑ "HP Paid Intel $690 Million to Keep Itanium Alive - Court Findings". ↑ McMillan, Robert (February 1, 2012). "HP Paid Intel $690 Million To Keep Itanium On Life Support" – via www.wired.com. ↑ components, Jamie Hinks 2015-04-20T16:44:00 109Z Computing. "Intel confirms new Itanium chips are on the way". TechRadar. ↑ 100.0 100.1 "Intel Itanium Processors Update". Intel Corporation. 2013-01-31. Retrieved 2013-02-12. ↑ Markoff, John (1994-06-09). "COMPANY NEWS; Intel Forms Chip Pact With Hewlett-Packard". The New York Times. Retrieved 2007-04-26. ↑ Hewlett-Packard Company; Novell; SCO (1995-09-20). "HP, Novell and SCO To Deliver High-Volume UNIX OS With Advanced Network And Enterprise Services". Press release. http://www.novell.com/news/press/archive/1995/09/pr95220.html. Retrieved 2007-04-25. ↑ Crothers, Brooke (1996-10-23). "Compaq, Intel buddy up". CNET News.com. Retrieved 2007-11-13. ↑ Veitch, Martin (1998-05-20). "Dell will aid Intel with IA-64". ZDNet.co.uk. Retrieved 2008-10-16. ↑ Lisa DiCarlo (1998-05-28). "Intel to delay release of Merced". PCWeek Online. Archived from the original on 2001-02-19. Retrieved 2007-05-14. ↑ "IBM Previews Technology Blueprint For Netfinity Server Line". IBM web site. 1998-09-09. Retrieved 2007-03-19. ↑ Stephen Shankland (2000-07-21). "Sun, Intel part ways on Solaris plans". CNET News.com. Archived from the original on 2012-12-05. Retrieved 2007-04-25. ↑ Kanellos, Michael (2001-11-14). "Itanium flunking Compaq server tests". News.com. Retrieved 2007-11-13. ↑ "Thunder at TOP500". TOP500 web site. Retrieved 2007-05-16. ↑ "Columbia at TOP500". TOP500 web site. Retrieved 2007-05-16. ↑ Morgan, Timothy (2005-07-06). "HP Ramps Up OpenVMS on Integrity Servers". ITJungle.com. Retrieved 2007-03-29. ↑ "IBM server design drops Itanium support". TechRepublic.com. 2005-02-25. Archived from the original on 2013-01-02. Retrieved 2007-03-19. ↑ "Result submitted to SPEC on June 13, 2005 by Hitachi". SPEC web site. Retrieved 2007-05-16. ↑ Shankland, Stephen (2005-09-15). "Dell shuttering Itanium server business". CNET News.com. Archived from the original on 2013-01-19. Retrieved 2007-03-19. ↑ Preimesberger, Chris (2006-07-19). "Is 'Montecito' Intel's Second Chance for Itanium?". eWeek. Retrieved 2007-03-23. ↑ "CentOS Product Specifications". Centos.org. Retrieved 2011-04-12. ↑ Ricknäs, Mikael (2009-12-21). "Red Hat to Drop Itanium Support in Enterprise Linux 6". PC World. PCWorld Communications, Inc. Retrieved 2011-03-25. ↑ Niccolai, James (2009-05-08). "Microsoft Ending Support for Itanium". PCWorld. Retrieved 2010-04-05. Windows Server 2008 R2 will be the last version of Windows Server to support the Intel Itanium architecture," [...] "SQL Server 2008 R2 and Visual Studio 2010 are also the last versions to support Itanium. ↑ "Intel C++ Composer XE 2011 for Linux Installation Guide and Release Notes". Retrieved 2011-04-12. ↑ "Intel Reaffirms Commitment to Itanium". Newsroom.intel.com. 2011-03-23. Retrieved 2011-04-12. ↑ McLaughlin, Kevin (2011-03-28). "HP CEO Apotheker Slams Oracle For Quitting Itanium". Crn.com. Retrieved 2011-04-12. ↑ Prickett, Timothy (2011-04-14). "Huawei to forge big red Itanium iron". Theregister.co.uk. Retrieved 2011-11-20. ↑ McMillan, Robert (2012-02-01). "HP Paid Intel $690 Million To Keep Itanium On Life Support". wired.com. Retrieved 2012-02-03. ↑ "SAP Product availability Matrix". SAPPAM web site. Retrieved 2012-06-06. ↑ Oracle Corporation (2012-09-04). "Oracle Issues Statement". Press release. http://www.oracle.com/us/corporate/features/itanium-346707.html. Retrieved 2013-03-08. ↑ "HP NonStop server update". Intel Corporation. 2013-11-05. Retrieved 2013-11-05. ↑ V3.co.uk "HP's Xeon-based Superdome is another nail in Itanium's coffin" Check |url= value (help). V3.co.uk. 2014-12-05. Retrieved 2014-12-25. Wikimedia Commons has media related to Itanium.